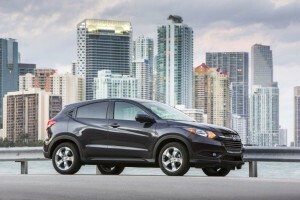 Get the scoop on Honda’s all new crossover SUV, the HR-V, in this Expert Review from Edmunds.com. 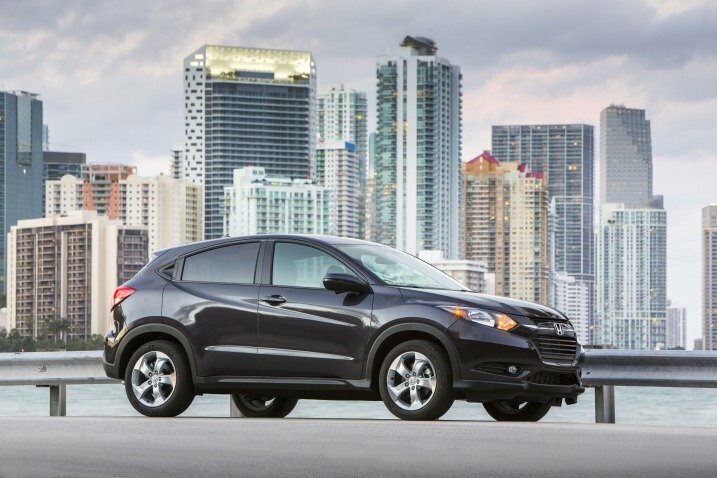 The 2016 Honda HR-V is all-new. Being the tyke of the family doesn’t mean there’s a lack of utility, though. Just like the subcompact Fit hatchback on which it’s based, the HR-V has what Honda calls a “Magic Seat,” which is a configurable rear seat that gives the HR-V a distinctive ability to take on bulky or long cargo items with relative ease. The HR-V also provides high fuel economy, a sporty driving feel, available all-wheel drive and a solid collection of tech and convenience features for the money. If you want a crossover SUV but have found the mainstays a little too big or expensive, Honda’s HR-V could very well meet your needs. 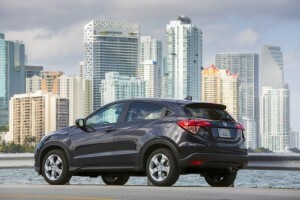 The HR-V happens to be part of a growing group of subcompact crossover offerings. The segment includes Nissan’s Juke, which is more powerful but less roomy than the HR-V, and the recently introduced Jeep Renegade, which boasts the best off-roading credentials of the bunch. Another new option is the Mazda CX-3, which distills the Mazda CX-5’s sporty personality into a smaller package. There’s also the stylish Fiat 500X to consider. You’ll want to check out at least a few of these before you decide, but if interior versatility and space are priorities, Honda’s “baby” crossover could very well be the ideal pick. Opt for the EX and you’ll enjoy a sunroof, rear privacy glass, foglights, keyless ignition and entry, heated front seats, automatic climate control, a passenger-side blind spot camera (Honda’s LaneWatch), a 7-inch touchscreen display, a six-speaker sound system (with an additional USB port) and HondaLink. Topping the line is the EX-L Navi. It further comes with roof rails, leather upholstery, a navigation system, an auto-dimming rearview mirror, and satellite and HD radio. In Edmunds testing, an HR-V EX-L Navi with AWD accelerated from zero to 60 mph in 9.7 seconds, which is slower than average for a subcompact crossover. According to the EPA, a front-drive HR-V will get 28 mpg in combined driving (25 city/34 highway) with the manual transmission or 31 mpg combined (28/35) with the CVT. Opting for all-wheel drive reduces fuel economy slightly to29 mpg combined (27/32). In our instrumented testing, an EX-L Navi AWD stopped from 60 mph in 124 feet, which is an average distance. Even in base LX trim, the 2016 Honda HR-V’s interior impresses with its design and amenities. Entering and exiting is very easy, and once inside you’ll enjoy an interior devoid of gimmickry. The gauges are large and visible, and most controls fall readily to hand and are simple to use. The 7-inch touchscreen display on EX and EX-L Navi trims handles the entertainment, communications and navigation functions as well as the HondaLink smartphone app integration system. It’s not our favorite interface, as we’ve found the on-screen menus a little confusing and the lack of a physical volume knob off-putting. Note that Android phones are currently incompatible with HondaLink, although Honda claims that this will change soon. Seating is comfortable for four average-size adults. And with its relatively generous greenhouse, there’s an expansive feel to the HR-V often missing in compact crossovers with more adventurous styling (Nissan’s Juke) and/or coupelike profiles (the Mercedes GLA). To be sure, this isn’t your neighbor’s Suburban, but it’s big enough that you can take the neighbors to dinner. You’ll still be able to haul a good amount of stuff with your HR-V, though. With a child safety seat on the “40” side of the 60/40-split rear seat, for instance, the HR-V can still easily accommodate a road bike on the other side (with the front wheel removed), which is a rare feat for a subcompact crossover. The rear seat bottom can also be raised to create a narrow but tall space behind the front seatbacks, or you can lower the front passenger seat to accommodate long items like surfboards. With the rear seats up on a front-drive HR-V, there are 24.3 cubic feet of luggage space available. Folding the seats flat opens 58.8 cubic feet, which is excellent for this class. All-wheel-drive HR-Vs have slightly less space (23.2/57.6). While the 2016 Honda HR-V’s gas savings will bring a smile, its 1.8-liter four-cylinder engine’s power is less impressive. In-town driving or highway cruising are sufficiently relaxed and efficient, but when forced to accelerate quickly, the 2016 HR-V feels sluggish. The droning engine sound on CVT-equipped models at full acceleration is also loud and off-putting. Going with the six-speed manual transmission helps alleviate the droning, but it’s only available with front-wheel drive. Beyond the performance disconnect with the 1.8 liter four and CVT, we are pleased by the HR-V’s level of on-road refinement and composure. It feels solid and sporty when driving around turns, and its highway ride is comfortable and composed. Another bonus is the HR-V’s excellent outward visibility, which combines with its small size to make it an easy car to drive in urban environments.